Total Removals use only modern, containerised warehouses that have stringent fire control systems in place reinforced by a strict non-smoking policy. Total Removals is able to offer a modern, secure and humidity controlled warehouse using a sustainable wooden container storage system. This system is highly efficient in that the containers are stackable and can often work out considerably cheaper and more secure than alternative self-storage units. 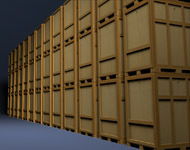 Single containers are able to hold around 250 cubic feet. Please note: items that cannot be stored include flammable liquids & gas, hazardous materials, plants and any perishable goods. Click here for a same day quote! Or call us on 0208367 8348! Who we are and why we are right for you! The best people to tell you about TRS!